King Fahara'jad is the ruler of Sentinel and thus one of the chief leaders of the Daggerfall Covenant. With his wife Za-Rifah, he had three children: Maraya, Lakana, and Azah. To solidify the Covenant, he agreed to political marriages for two daughters; the eldest, Maraya, married High King Emeric, while Lakana was married to Duke Nathaniel. Walking into the Sentinel Palace for the first time, King Fahara'jad can be heard speaking with Talia at-Marimah. Talia at-Marimah:' "With all respect, Your Majesty, this proves out suspicions were well-founded...you should have heeded my father's warning." King Fahara'jad:' "It is not the place of the dishonored to correct the king, Ash'abah. You are dismissed." Talia at-Marimah:' "I meant no disrespect, Your Majesty, only that...you know where to find us. I will take my leave." "Welcome to Sentinel, wayfarer. If you've come about the docks, rest assured, I already know. I regret that you visit during such times, but perhaps your arrival is fortuitous. Perhaps the gods guided you here to help us fight the Withered Hand." Who or what is the Withered Hand? "Necromancers, practitioners of the most vile magic, and the bane of the Alik'r Desert. It has been many years since we faced such a threat. I hoped the rumors about this group——the Withered Hand——were untrue, but today's events prove otherwise." Where did the Withered Hand come from? "Several years ago, a diabolical necromancer named Suturah led an army of undead against me. Suturah was defeated, but the rumors suggest his sons have returned for revenge. They are calling themselves the Withered Hand." So the necromancer at the docks was with them? "Undoubtedly, but I suspect the attack at the docks was merely a feint. I fear the Withered Hand is planning something far worse." "Ah, that is the challenge I now face. The people of the Alik'r Desert, even those in Sentinel, are superstitious. They believe that striking the dead carries a terrible curse. For them, it is an act of dishonor. That is why I need you, wayfarer." I will help however I can, Your Majesty. "The your visit is fortuitous indeed. My own son——Prince Azah——has been investigating the rumors about the Withered Hand. He is a bright young man, but he needs help. First though, I would ask you to inform General Thoda of what has befallen." General Thoda? I met him in Alcaire. "Yes. That is likely. General Thoda is my chief military advisor. he is also a practical man who places security above superstition. He is resting at his home after returning from Alcaire, but I need his counsel on how to proceed." I'll go speak with General Thoda right away. King Fahara'jad can be asked about the last time the undead attacked as well as the basis for the superstitions surrounding them. "General Thoda is a trusted advisor and a good friend. He has heard the rumors about the Withered Hand, and he can help us. Tell no one else though. People remember Suturah, and hearing his sons have returned could cause a panic." How did you defeat Suturah?/How did you defeat them before? "It's quite a tale, and I cannot to it justice now, but the battle against Suturah was the most difficult of my life——both in military and political terms. It was the Ash'abah who saved us. They had the thankless task of fighting the undead." "The Ash'abah. Where do I begin? They walk among us, but only in shadows. People believe they are cursed. They are dishonored warriors, bound by the sacred oath of their forefathers. They must fight the dead when called upon to do so." "I have not called on them. I have even disregarded their warnings. You must understand——the common people despise them. To call on them again might cost me the crown. That is why I must rely on you, wayfarer." Where did the superstitions come from? "It is not an ancient Yokudan custom, but a tradition that developed in the desert. Human remains decay slowly here, and our people came to believe their ancestors' corpses were sacred. To harm one would draw the ancestors' curse." And the people still believe that today? "Of course. You see, the culture of the Alik'r evolved around this ideal. Many of us today realize that exceptions must be made, but in my position, to ask my soldiers to strike down the dead would cause an outcry, and possibly lead to rebellion." Hasn't the Alik'r had to fight undead sometime in its history?/But surely the Alik'r has faced undead in the past?/Did the Alik'r ever face an undead threat before the Ash'abah? "Yes. The greatest threat the Alik'r faced from the undead was in the First Era, when the Yokudan rulers were still establishing a foothold here. That was when the Ansei Wards were created." What are the Ansei Wards? "They are our greatest hope, for no matter how great a threat the Withered Hand may pose, they cannot even compare to the necromancers of the First Era. The Wards contain the spirits of three Ansei heroes who sacrificed themselves to protect us." How do the Ansei Wards work? "They uphold the covenant with the Divines. As long as we consecrate the dead in the name of Tu'wacca, they cannot be raised by even the most powerful necromancy. Thus the Withered Hand can only raise corpses that have not been consecrated." After rescuing Prince Azah the king must be reported back to. "Word has reached me of what happened at the seraglio. I should have seen this coming. Please. Tell me you found Prince Azah and he is safe." Yes. He's safe and unharmed. "I told Thoda you'dd come through. I had a feeling about you, right from the start. Tell me though, where is Azah, and was this the extent of the Withered Hand's plot? Or do they presently plan some further insult to my family and my kingdom?" Azah went to the Impervious Vault. He says they're trying to tunnel in. We must hurry. We have to stop them at all costs." "I can take guards to the Impervious Vault, but we're going to need help...from the Mages Guild. As much as I hate to admit, only they know how to unseal the vault. Will you go to the guild for me, wayfarer?" Yes. I will ask the Mages Guild to help us. "When you reach the Mages Guild tower, speak to Gabrielle. She understands the need for discretion. I will meet you at the Impervious Vault. Tu'whacca watch over you, wayfarer. Let us hope we can keep the Ansei Wards from falling into enemy hands." What exactly are the Ansei Wards? "Of course. If you were not raised here, you would not know. The Ansei Wards were created centuries ago, the first time necromancers threatened the people of the Alik'r. They were created to protect us from the risen dead." They don't seem to be doing a very good job. "Or perhaps the protections are not so evident. The Ansei Wards maintain our covenant with Tu'whacca. If we consecrate our dead, those dead cannot be raised. This, the Withered Hand can raise only unconsecrated corpses." So where do all these undead come from? "Our priests perform the consecration ritual at funerals, but if the corpse is lost, thus is not possible. Additionally, Suturah was also fond of murdering people and raising them right away. I assume the Withered Hand is doing the same." So what happens if they steal the Ansei Wards? "It would be unthinkable. With the Ansei Wards, the Withered Hand could raise our most honored ancestors——legendary warriors who were heroes in life, but would be most terrible enemies in death. That is why they must be stopped." Once Gabrielle has been spoken to and assisted, Fahara'jad can be found at the doors of the Vault. "If we are too late, the implications are unthinkable...for all of Alik'r. I've prayed to Tu'whacca, Stendarr, and even Akatosh. Though I do not hold them sacred, I will pray to the Yokudan gods as well. Just in case." Don't worry, Your Majesty. Everything will work out. Your hope is contagious, wayfarer. I am pleased that your road has lead you here. General Thoda is not a man of faith, but even he agrees your coming seems more than a coincidence. If only one of us can enter the vault, I think it should be you." "I cannot adequately express my gratitude. You must be careful, though. Azah believes the Withered Hand is far more powerful than we realized——Uwafa and Alasan in particular. If you see either of them, I suggest you exercise extreme caution." Thank you for your concern, Your Majesty. "I pray that we are not too late to stop the Withered Hand, and with the same breath, I thank the gods for guiding you here. Tu'whacca watch over you, wayfarer. Here comes Gabrielle. Are you ready?" Yes. I'll go in as soon as she breaks the seal. After the Vault has been explored, King Fahara'jad must be reported to with the bad news. "That took longer than I hoped. It's hard to be patient when I know the fate of my kingdom is at stake. Tell me you have good tidings...or did they escape with the Ansei Wards?" They escaped with the Ansei Wards. "Damn it all! Thoda said Suturah's sons were dangerous. That's certainly true now. With the Ansei Wards, they can raise an army faster than I can! We have to stop them. We have to send Uwafa and Alasan to join their father in Oblivion!" "I've done everything in my power to avoid calling on the Ash'abah, but I no longer have a choice. We must have their help to recover the Ansei Wards. I would avoid contacting them directly, however. Will you be my envoy, wayfarer?" Yes. I will speak to the Ash'abah for you. "Thank you. Most of the Ash'abah live together, wandering the desert, going gods-know-where. Track them down and tell their leader Marimah that the Alik'r needs him again. We need the Ash'abah to fight the Withered Hand." "The Ash'abah often spend this season camping at Morwha's Bounty to the south. Gods willing, perhaps they are still there. Marimah sent his daughter to warn me of the Withered Hand. They wanted to help. I regret that I turned them away." I will find them and ask them to help now. "I hope I needn't remind you to keep this quiet. Rumors will spread about the Withered Hand, but we should try to keep the theft of the Ansei Wards a secret. I have many political enemies who will try to turn this to their advantage." Will calling upon the Ash'abah be a problem? "Of course it will, but what am I to do? Allow my public image to endanger the kingdom? Sometimes a king cannot save his face and his people at the same time. Still, I would prefer we not shout our plans from the rooftops." The King can be found within the Vault once all three of the Ansei Wards have been recovered and the Withered Hand destroyed. "One cannot be a great ruler without first being an impeccable judge of character. You walked into my palace a stranger, but I trusted you immediately. You have proven that my faith was well-placed." It has been an honor, Your Majesty. "Come though. This is an historic day. We have strengthened the seals on the Impervious Vault. Your friends and many others have gathered to witness the return of the Ansei Wards to their rightful place. Take them. The honor is yours." I will restore the wards. Once the Wards have been restored, King Fahara'jad will give a speech to those assembled. King Fahara'jad: "Today is a good day, my friends. Our sacred guardians are restored!" "The specter of undeath threatened our kingdom, our lives! The sands of the Alik'r howled with the outrage of our honored ancestors!" "Now though, the spawn of Suturah are dead, and they will remain that way! The Withered Hand is scattered!" "Many of you already know this, but all this was accomplished only because of this one who stands here before you." "The spirit of Divad raises his blade in salute. Someday, this hero's song will be sung in the Chants of Praise." "All hail our great protector! All hail the hero of the Alik'r!" "In addition to the public praise, I must add my own private words of appreciation, wayfarer. You not only saved the kingdom, you also saved its king. My reign would have been buried in the sands had you not intervened. Thank you." "In honor of your selfless dedication, your unwavering courage, and the incredible service you have done the kingdom, I have a gift. This was one of Sentinel's greatest treasures. Now it is yours. I know you will use it well." "It may seem unappreciative to ask more of you, but I would be neglecting my duty to the Daggerfall Covenant if I did not inform you of the tragedy at Bangkorai. Any hope of peace there seems to have dried up in the wake of recent events." "King Eamond is dead. Killed by the Reachmen. They have long sought to reclaim northern Bangkorai, and the war in Cyrodiil has given them the perfect opportunity. I am told the Reachmen march on Evermore even now. The city is in grave danger." Isn't the Covenant sending troops? "Of course, but it'll take time——time Evermore doesn't have. You could go now. They need someone like you to rally the city's defenses. After what you've accomplished here, I have no doubt you can make a difference. Will you go, wayfarer?" Yes. I'll go to Bangkorai and see what I can do. Once accepting Kingdom in Mourning, King Fahara'jad can be further questioned. "King Eamond has a stableboy who...kept me informed, but I've heard nothing since the king's death——not even a word of who assumed the throne. His name is Ramza. Find him and tell him I sent you to help. We cannot allow Bangkorai to fall." How do I get to Bangkorai? "Most of the Bjoulsae River shipping has been commandeered for the war, so I suggest you take the bridge from Stormhaven——or if you prefer, there is a more expedient way. Gabrielle can open a portal. You can be in Evermore within the hour." Did King Eamond have any heirs? "Indeed. A son and a daughter. Very young last I saw them, but his son would be his heir. Eamond's wife, Queen Arzhela, is cousin to King Emeric, so she is likely acting as regent...Whatever is necessary to keep Bangkorai from falling." Is High-King Emeric sending aid? 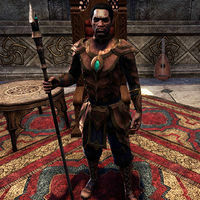 "If the situation in Bangkorai is as dire as it sounds, I expect Emeric will send the Lion Guard. But they will have to muster and march from Wayrest so it will take time. Still, if Evermore can hold out against the Reachmen aid will eventually come." He appears as High King Fahara'jad in the Circus of Cheerful Slaughter. Upon the conclusion of Restoring the Ansei Wards, he'll remain in the Impervious Vault. This page was last modified on 18 August 2018, at 13:00.